4 November 2009: In a landslide victory, Shirley Franklin became the 58th city mayor of Atlanta, in November 2001. Never having previously been an elected official, Shirley Franklin became the city’s first woman mayor, and the first African-American woman to serve as mayor of a major southern city. On 8 November 2005, she won re-election with more than 90 per cent of the vote. Her public service career began in 1978 when she served as the Commissioner of Cultural Affairs under Mayor Maynard Jackson. Under the leadership of Mayor Andrew Young, she was later appointed as the nation's first woman Chief Administrative Officer or City Manager, where she was responsible for all the daily operations of a city that was a $1 billion dollar corporation with nearly 8,000 employees and was charged with guiding the development of Hartsfield International Airport, a new city hall, a new municipal court building and 14,000 net housing units. Shirley Franklin continued her public service as Executive Officer for Operations during the third term of Mayor Jackson. In 1991, Ms Franklin joined the Atlanta Committee for the Olympic Games (ACOG) as the top ranking female executive, serving as senior vice-president for external relations. In this position she was instrumental in the development of such legacies as the Centennial Olympic Park and served as ACOGs primary liaison with various labor unions, civil rights groups, neighborhood/community organizations, and environmentalists. In 1997 she formed Shirley Clarke Franklin & Associates, a management and consulting firm for public affairs, community affairs and strategic planning and in 1998 became a majority partner in Urban Environmental Solutions, LLC. Following the election of Governor Barnes in 1998, Ms Franklin served on his three-person transition team and in 1999 accepted his invitation to serve on the Georgia Regional Transportation Authority (GRTA), where she was elected vice-chair. 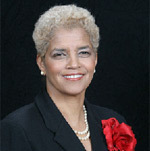 She resigned from GRTA in April 2000 and officially declared her candidacy for Mayor of Atlanta. Since her inauguration on 7 January 2002, she has taken on the specific and deifficult challenges of governing in the new millennium. Her first task as mayor was to fill a budget gap of $82 million and deliver the 2002 balanced budget to the city council. To balance the budget, she cut her own salary by $40,000, cut the Mayors department staff by 50 per cent, axed 277 jobs, eliminated 605 vacancies and raised taxes. She recalled non-essential city-owned cars, cell phones and credit cards and issued an administrative order to freeze vacancies except in public safety. These were difficult and painful choices to make, but necessary to balance the budget. Over the course of her outstanding career, Ms Franklin has been featured in Business to Business magazine, the New York Times, Ebony magazine, Jet magazine, Heart & Soul magazine, Savoy magazine, Glamour, Time Magazine, Women Looking Ahead magazine, Atlanta Good Life magazine, Atlanta Woman magazine, Georgia Trend magazine and was recently chosen as one of Atlantas movers and shakers in Jezebel magazine. Prior to her second term re-election, Franklin was named one of the US' five best big city mayors by TIME Magazine, alongside Richard Daley and Michael Bloomberg. 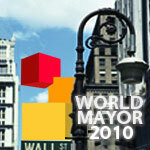 In 2005, she was short-listed for the World Mayor Award. A leading women's advocacy group, The White House Project, named Mayor Franklin one of "8 in 08" female politicians who could make a presidential run, the only non-national politician or governor on the list. Franklin was however later named as co-chair of the 2008 Democratic Convention. She is also past president of the National Convention of Democratic Mayors and a leading member of the Mayors Against Illegal Guns Coalition. Franklin has had her critics during her two terms, particularly as she prepares to leave office. The patent medicine proposed by the mayor to address the city's burgeoning budget crisis  swinging cuts to the payroll, service cuts and a massive hike in property taxes  have alienated even her closest supporters. Having entered city hall on a blaze of enthusiasm pledging to tackle the dysfunctional budgeting and corrupt management practices, including ghost employees, she may well leave with a tainted legacy of allowing the same sort of routine maladministration to continue on her watch. She may well hope that some of the Obama stardust rubs off on her during the convention. Born in Philadelphia, Shirley Franklin gained her Bachelor of Arts degree in Sociology from Howard University and continued her education earning her Masters of Arts degree in Sociology from the University of Pennsylvania. In May 2002, she delivered the commencement address and was awarded an honorary Doctor of Law degree from her alma mater, Howard University.